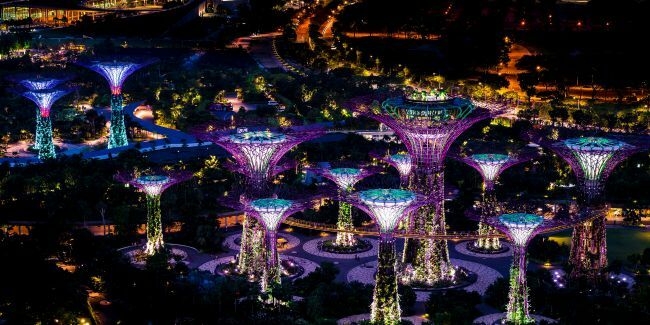 Singapore’s Gardens by the Bay. Photo by Mac Qin. A multicultural society where east meets west, Singapore is a diverse melting pot of cultures and races. With a unique identity that honors tradition yet embraces change, it serves as a regional hub for many international brands. Always at the forefront of technological and economic advances, Singapore is closely aligned with the latest global and regional culture, trends, and news. The rise of social media globally has deeply influenced and reshaped the way people in Singapore work, collaborate, and consume information—especially within marketing and communications. With the highest global ranking for smartphone penetration and a large population of multi-device users, Singapore’s social media landscape is evolving at a fast pace. The island is now home to thriving online communities and sophisticated users for whom social media has become an essential part of everyday life. Singapore celebrates 50 years of independence this month, with thousands of events being held under the #SG50 banner. Continuing our State of Social series, we thought it was a great opportunity to take the pulse of this hyper-social city state. Singapore is a hive of activity this year, with events like the recent SEA Games and upcoming F1 Grand Prix sparking conversations on social. A more somber event—the passing of the nation’s founding father, Lee Kuan Yew, in March—also had a major social media footprint. And pulling all those conversations together, the #SG50 hashtag has been heavily leveraged by both brands and users to commemorate the yearlong celebration of the nation’s golden jubilee. Indeed, as of July, according to data from uberVu via Hootsuite, there has been over 220,000 hashtag mentions on Twitter and Facebook, and over 274,000 posts on Instagram. While social media giant Facebook remains one of the most used platforms in Singapore, with around 2.4 million daily users, it has become an increasingly competitive and saturated marketplace for brands to connect with fans. As a result, we are seeing more diversification in social media outreach on platforms such as Instagram and other mobile messaging apps. With WhatsApp as the most popular social network in Singapore, the line between social media and mobile messaging has become increasingly blurred. Users are flocking to other mobile messaging apps as well, such as LINE and WeChat, to connect and engage with their friends, as well as their favorite brands. For example, brands such as Gong Cha, McDonald’s, and even Wall Street Journal are already establishing brand channels on LINE as a means to connect with the growing mobile audience. If this trend continues in 2016, we can expect more convergence between social media and mobile messaging services. More brands will be joining these mobile messaging platforms as they look for ways to connect with customers beyond the social media universe of Facebook and Twitter. In recent years, social media has made sharing of ideas and opinions more accessible for Singapore users. This has led to friction between a population increasingly embracing social and authorities in a society which, by western standards, constrains free speech. Recent government crackdowns on free expression on social media have gotten strong media traction, reigniting the debates on the limits of free speech. While social media in Singapore has become a forum for fraught political discourse, it has also helped Singaporean citizens share support online, using it to raise awareness of important issues or unite when tragedy strikes. On a daily, it is common to see your social news feed full of heartwarming acts of kindness committed by fellow Singaporeans. Unsurprisingly, this has not gone unnoticed by brands. Media publications and even local political leaders always keep their fingers on the social media pulse for up-to-the-minute updates on breaking news and trends. For example, Singapore’s Prime Minister, Lee Hsien Loong uses Facebook and Instagram cultivate personal connections with the community, and as a platform to provide the latest updates on national issues. Last but not least, we are also seeing a lot of great user-generated content from the SG50 celebration from both brands and users alike. For instance, Coca-Cola’s #SG50 Share a Coke campaign has been a success both offline and online as customers are invited to share their “Share a Coke” stories, photos and videos on social media using the hashtag #ShareaCokeSG and #SG50. And who can ever forget the hashtag #SG50ShadesOfGrey that went viral few months ago? Combining SG50 and the premiere of the movie 50 Shades of Grey, Singaporeans showcased their creative humor with steamy locally relevant jokes; brands like Scoot and OCBC’s youth brand FRANK were quick to leverage the trending hashtag too. In many way Singaporeans use social media like Americans and Europeans. In others, their social habits are unmistakably Asian. The state of social is like so many things in Singapore: a unique combination of East and West, tech-savvy and traditional, energetic yet somewhat restrained. Marketing Director at Hootsuite. Passionate about the media scene and how consumers react to the constant evolution.